Cool tshirts and copies of "lime"
T-shirts are now available! Inkwell Prints and Gifts is the name of my new business, and I'm selling t-shirts, magnets, journals, and stationery. To order, email to ensure availablity, then send check or money order to Inkwell Prints and Gifts, 6066 Shingle Creek Pkwy #148, Brooklyn Center, MN 55430. See the bottom of the page for merchandise now available by mail-order. 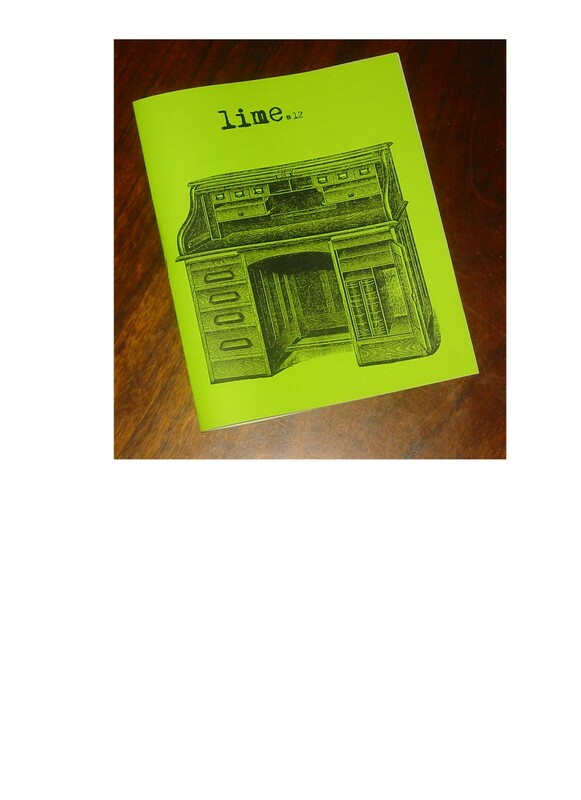 Issues one through five are out of print, but selected material from these issues will be included in lime #10, a "Best-of-lime" issue. To receive copies of back issues, please email me at klas0031@tc.umn.edu, or write to Ariana/lime zine, 6066 Shingle Creek Pkwy #148, Brooklyn Center, MN 55430. 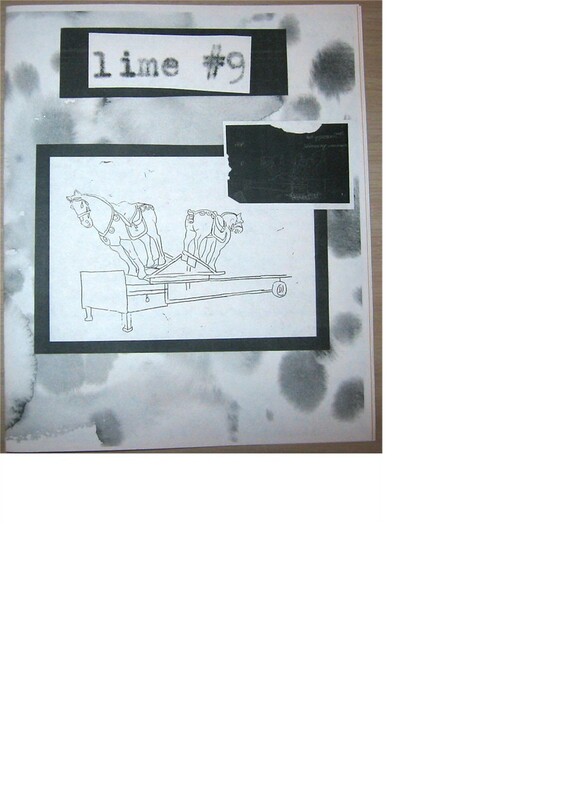 (See bottom of page for #s 11 and 12 -- it's hard to change the order of content on this page) Cover has a tracing of a photograph I took of giant ceramic horses on a trailer, layered over a watercolor background. A little more subdued and less silly than previous issues, but I got great feedback on the writing. Highlights: "Where Children Don't Belong", a memory piece about collecting cans along the Mississippi; huge "Dreams" section with the trippiest collection of dreams yet; poetry; quotes. 20 pp. legal size paper folded in half. Price: At Dreamhaven Books, Minneapolis: $1. From me: second-ounce stamp (63 cents) or two stamps. 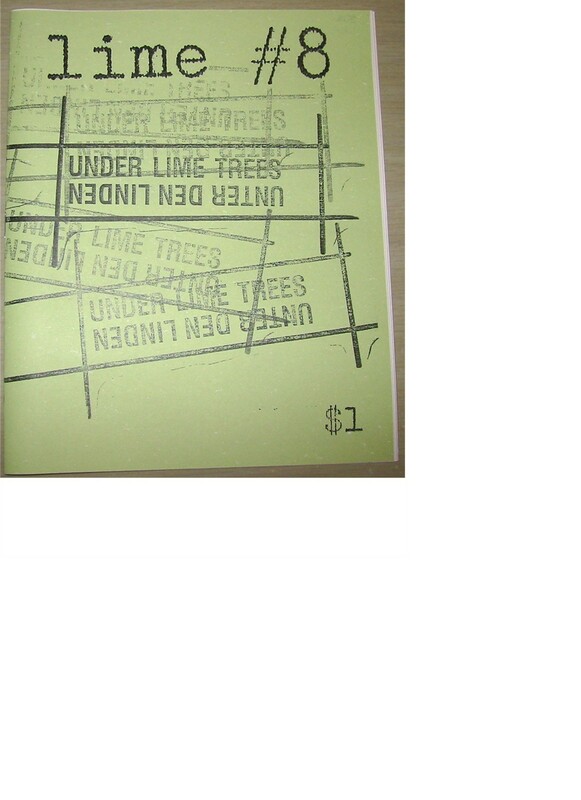 Cover is a photocopy of "Under Lime Trees" rubber-stamp by Lawrence Weiner. Highlights: State Fair story with photos; stream-of consciousness writing; bathroom clutter; quotes. Price: one second-ounce (63 cent) stamp or two stamps, direct from me. 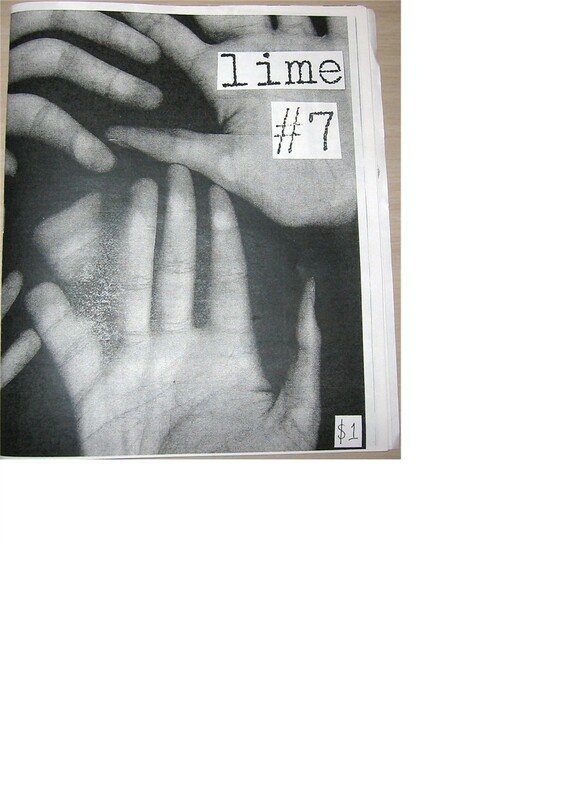 Cover has warped photocopy of hands, achieved by Ivy and I putting our hands on the copier and moving them while the copy was being made. Highlights: Kids' art; quotes; comic about Hazel the cat; random thoughts. Price: One second-ounce (63 cent) stamp or two stamps. 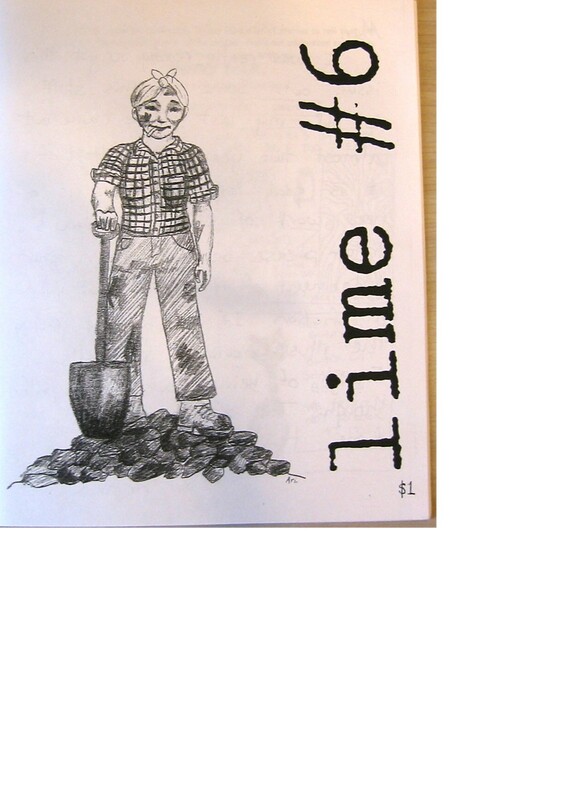 Cool Rosie-the-Riveter style illustration of my friend Neal's grandmother shoveling coal. Highlights: "Grandma Klassen's Scary Bathroom" cartoon; Art Film Review; random stories; quotes. Price: one second-ounce (63 cent) stamp or two stamps. One of my favorite recent issues: A reader favorite is "Adorable Buster, Evil Buster", about my angel/devil doggie. 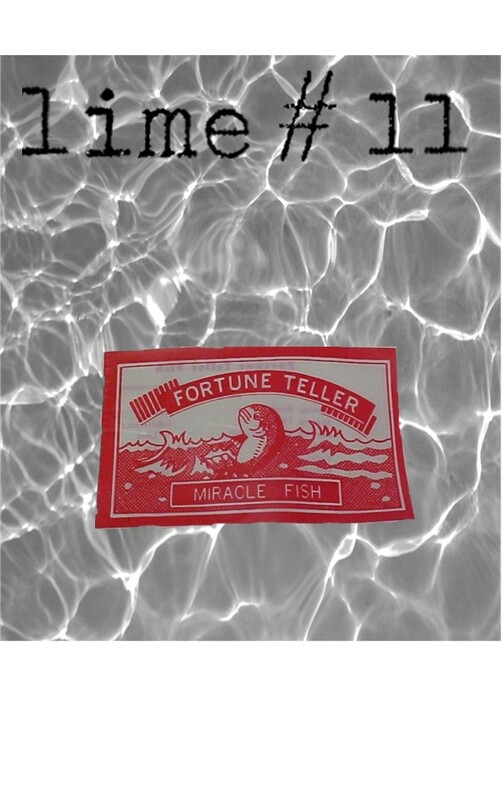 Also: The Dollar Store Index, Queen of the Faux Pas, lots of dreams, a decent poem, and New Job Diary. Price: one second-ounce stamp (63 cents) or two stamps. Just released, lime #12 features "Waking Life Revisited", about "real human moments" with strangers. Also, a lovely "quotes" center page, "Turkeys and Trophies", dreams, "Pretty Good to Me", and "Eat!" Price: one second-ounce stamp (63 cents) or two stamps. Inspired by my sister's friend Angelina who works in a fancy restaurant where they pooh-pooh ketchup, the "I like ketchup!" shirt is hand-screened onto a white t-shirt with red collar and cuffs. The women's sizes run small so order a size up from usual. They have a curvy fit and are not real long. The men's sizes seem to run a little big and are a standard t-shirt fit. $17, includes domestic shipping. These shirts will remind you of junior high. Image is a white scrap of notebook paper with one of two "check box" designs: Will you go to the dance with me? Yes, no, maybe. or Do you like me? Yes, no, as a friend (give them an out). On your choice of t-shirt colors: black, red or blue. Women's sizes only, and they run a little small so order a size up from usual. $17, includes domestic shipping. To order, email to ensure availablity, then send check or money order to Inkwell Prints and Gifts, 6066 Shingle Creek Pkwy #148, Brooklyn Center, MN 55430.